Inter-University Chess Competition 2019 held at KUET on 28-30 March, 2019. Dhaka University ran out as Champion of this tournament. A total of nine teams battled for the trophy with the games being played in Swiss League system. Jagannath University and Jahangirnagar University ran out as runners-up and second runners-up respectively in this tournament. Vice-Chancellor of KUET Prof. Dr. Quazi Sazzad Hossain distributed prizes among the winners in the prize giving ceremony which was held on 30 March in the evening. This event was presided over by the Director (Student Welfare) Prof. Dr. Shibendra Shekher Sikder. Deputy Director of (Student Welfare) Dr. Ismail Saifullah, Joint-Secretery of Bangladesh Chess Federation Masudur Rahman Mollick, Deputy Director of Physical Education Center of Dhaka Universiy Md. Jalal Uddin, Assistant Director (Physical) of KUET Md Helal Fakir, Manager of the Teams, Sayed Atai Rabbi delivered speech in the occasion. This event was presented by the Public Relations Officer of KUET Monoj Kumar Mojumder. Total 45 players Including 5 players in one team attended this tournament from Dhaka University, Rajshahi University, Jahangirnagar University, Rajshahi University of Engineering & Technology, Khulna University, Noakhali Science and Engineering University, Hajee Mohammad Danesh Science & Technology University, Jagannath University and Khulna University of Engineering & Technology. It is mentioned that, the Management Meeting was held on 28 March in the evening and the tournament inaugurated by the VC of KUET Prof. Dr. Quazi Sazzad Hossain was held on 29 March in the morning. Inter Hall Cricket Tournament 2018-19 held at KUET. On 29 March, in the final match of the tournament, Amar Ekushey Hall got the honor of champion defeating Bangabandhu Sheikh Mujibur Rahman Hall by 2 wickets. Bangabandhu Sheikh Mujibur Rahman Hall got the award of runner-up trophy. Vice-Chancellor of KUET Prof. Dr. Quazi Sazzad Hossain was present in the final match of the tournament as the chief guest. He enjoyed the final match and awarded the champion trophy, runner-up trophy, prize of individual players, man of the matches, man of the final, best wicket taker and highest run achiever. Tonoy from the winner team was selected for the man of the final and Partho Adhikari and Shihab from the Fazlul Haque Hall were selected for the Man of the Tournament and Best Emerging Player respectively. Director (Students’ Welfare) Prof. Dr. Shibendra Shekher Sikder presided over the prize given ceremony. Among others Provost of Amar Ekushey Hall Prof. Dr. Md. Abdul Motin, Provost of Bangabandhu Sheikh Mujibur Rahman Hall Prof. Dr. Pintu Chandra Shill, Captain and manager of Amar Ekushey Hall Md. Fazlul Bari and Hridoy Chandra Pal, Captain and manager of Bangabandhu Sheikh Mujibur Rahman Hall Md. Shamsuzzaman Samu and Durjoy spoke in the prize giving ceremony. Teachers, Officers, Staffs, viewers and students were present in the tournament and the prize giving ceremony. It is Mentioned that, the inauguration ceremony and first match of this cricket tournament was held on 22 February, 2019. Khulna University of Engineering & Technology (KUET) celebrated Independence & National day of Bangladesh on March 26, 2019 by paying respect to the country’s most illustrious sons who were brutally killed by the Pakistani occupation forces and their collaborators in the nine-month bloody war with Pakistan in 1971. On 26 March, early in the morning the national flag was hoisted atop all important buildings in the campus. At 8:45 “Gonosangit” was performed by the KUET students in front of the Liberation War Sculpture ‘Durbar Bangla’. At 9:30 a.m on behalf of the University Hon’ble Vice-Chancellor of KUET Prof. Dr. Quazi Sazzad Hossain, placed floral wreaths in front of the Liberation War Sculpture ‘Durbar Bangla’. Later, Teachers Association, Director (Students’ Welfare), Officers Association, Provosts and students of different Halls, Karmokarta Samity (Up-gradation), Karmachari Samiti (3rd Class), Karmachari Samiti (4th Class), Khulna Engineering University School (Secondary & Primary), Unmesh Govt. Primary School, Master-roll Karmachari Samiti, Bangabandhu Karmachari Parishad, Hall Karmachari of KUET placed floral wreaths at the memorial. Later, a drawing competition for children was held at the SWC. VC of KUET distributed prizes among the winners of drawing competition as the Chief Guest. After Asr prayer a milad-mahfil was arranged at the KUET central mosque to pray for the departed souls of the Nation’s bravest sons. Later, at 07.00 p.m. a discussion meeting & cultural programmes related to independence day was held at the SWC. In addition, On 25 March, at 07.00 p.m. teachers, students, officers and employees of KUET gathered and brought out a procession of candle light led by the VC of KUET to commemorate March 25, 1971, the darkest night in the history of Bangladesh. With solemn respect the birth anniversary of the Father of the Nation Bangabandhu Sheikh Mujibur Rahman and National Children Day 2019 was observed at KUET. On 17 March at 9:00 a.m. on behalf of the University Hon’ble Vice-Chancellor of KUET Prof. Dr. Quazi Sazzad Hossain placed floral wreath in front of the portrait of the father of the nation Bangabandhu Sheikh Mujibur Rahman at Bangabandhu Square in Campus. Later, Teachers Association, Director (Students’ Welfare), Officers Association, Provosts and students of different Halls, Chattra Leage, Up-gradation Karmokarta Shomity, Karmachari Shomity (3rd Class), Karmachari Shomity (4th Class), KUET School, Master-roll Karmachary Shomity, Bangabandhu Karmachari Parishad, Hall Kormochari placed floral wreath. Moreover, Hon’ble VC of KUET Prof. Dr. Quazi Sazzad Hossain celebrated the occasion with birthday cakes which was arranged separately by the Bangladesh Chattra Leage, KUET Branch, Karmachari Shomity (3rd Class), Karmachari Shomity (4th Class) and Bangabandhu Karmachari Parishad. At 09:30 a.m. a discussion meeting was held at the Student Welfare Centre. Hon’ble VC of KUET Prof. Dr. Quazi Sazzad Hossain was present as the Chief Guest when Director (Students’ Welfare) Prof. Dr. Shibendra Shekher Sikder presided over the meeting. Dean of CE Faculty Prof. Dr. Quazi Hamidul Bari, Dean of EEE Faculty Prof. Dr. Mohiuddin Ahmad, Dean of ME Faculty Prof. Dr. Mohammad Ariful Islam delivered speech as the Special Guests. Vice-President of Teachers Association and Head of URP Department Prof. Dr. Md. Mustafa Saroar, Secretary of Teachers Association and Provost of Bangabandhu Sheikh Mujibur Rahman Hall Prof. Dr. Pintu Chandra Shill, President of Officers Association Engr. Md. Anisur Rahman Bhuiyan, Head Master of Khulna Engineering University School Ayesha Siddiqa, General Secretary of Bangladesh Chattra Leage, KUET Branch and also Member Secretary of Student Welfare Committee of KUET Sadman Nahiyan Sezan, President of Karmachari Shomity (3rd Class) Md. Mamunur Rashid Jweel, President of Karmachari Shomity (4th Class) Md. Imran Ali Roni and President of Bangabandhu Karmachari Parishad Sonali Binte Shorif also delivered speech there. Public Relations Officer Monoj Kumar Majumder was anchoring the session. Later, cultural program was also performed with the organized of Khulna Engineering University School (Primary & Intermediate) and Unmesh Govt. Primary School. Moreover, Hon’ble VC of KUET Prof. Dr. Quazi Sazzad Hossain distributed prizes among the winners of the Composition Writing, Drawing Competition, Good Hand Writing, Extempore Speech, Biography of Banganandhu etc. At 8:45 a.m. teachers and students of the schools also gathered and brought out a colorful procession led by the Hon’ble VC of KUET Prof. Dr. Quazi Sazzad Hossain. After Asr prayer a milad-mahfil was arranged at the KUET central mosque for the salvation the departed soul of the father of the nation Bangabandhu Sheikh Mujibur Rahman. Annual Sports Competition 2018 successfully held at KUET. The Hon’ble State Minister Begum Monnujan Sufian, Ministry of Labour and Employment of the People's Republic of Bangladesh was present as the Chief Guest. She distributed prizes among the winners at the Closing and Prize Giving Ceremony held on 08 March 2019 at 4:30 PM. She said in her speech “If we are unable to build a nation with information technology, we can not pay the liability of our freedom fighters. If we are united, we will be able to build a developed and enriched country. The people with sound body and mind can move forward the country and sports is very important for this. Students should take responsibilities to build a developed country with concentration on their academic study. The success will come if the destination is fixed by heart”. The Hon’ble Vice-Chancellor of KUET Prof. Dr. Quazi Sazzad Hossain presided over the event. He said, “Sports can ensure the brotherhood mentality among the students which can make the nation developed in future. Students should take part in sports and their academic studies simultaneously”. He also expressed his joy after watching the students enthusiastic manner at the competition. Director (Student Welfare) Prof. Dr. Shibendra Shekher Sikder, The President and The Secretary of Students Welfare Committee of KUET Md. Abul Hasan Shovon and Sadman Nahiyan Sezan delivered speech in the function. Dean of Faculties, Head of Departments, Directors, Provosts and Assistant Provosts of different Halls, Teachers, Officers, Students and Staff were present at the event. Before that, Vice-Chancellor of KUET Prof. Dr. Quazi Sazzad Hossain inaugurated the function hoisting the national flag, releasing of pigeons and color balloons in the morning at 9:00 a.m. at the play ground. Noted that, Total 38 events had been held from the 27 February, 2019 in this competition. From the male students Md. Tomirul Islam and from the female students Tanzila Parvin Ami became champion in the personal event. Bangabandhu Sheikh Mujibur Rahman Hall and Amar Ekushey Hall jointly won the championship trophy and Lalan Shah Hall won the runner-up trophy. The Farewell Ceremony of '14 batch students of Electrical and Electronic Engineering (EEE) Department of Khulna University of Engineering & Technology (KUET) was held on 07 March, 2019 at the Student Welfare Center at 5:30 PM. The Hon’ble Vice-Chancellor Prof. Dr. Quazi Sazzad Hossain graced the occasion as the Chief Guest. General Manager of Khulna Power Company Limited Md. Rezaul Ahsan, Dean (Acting) of EEE Faculty Prof. Dr. K.M.Azharul Hasan, Head of EEE Department Prof. Dr. Md. Rafiqul Islam, Director (Students’ Welfare) Prof. Dr. Shibendra Shekher Sikder were present as the Special Guests. 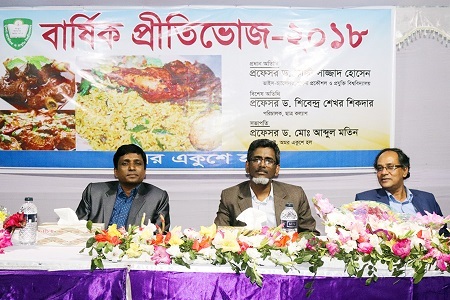 President of EEE Association Prof. Dr. Mohammad Shaifur Rahman presided over the function. At the ceremony crest was handed over to the outgoing students by the guests. The Farewell Ceremony of '14 batch students of Khulna University of Engineering & Technology (KUET) was held at Rokeya Hall on 06 March, 2019 in the evening. The Hon’ble Vice-Chancellor Prof. Dr. Quazi Sazzad Hossain graced the occasion as the Chief Guest. Director (Students’ Welfare) Prof. Dr. Shibendra Shekher Sikder was present as the Special Guest. 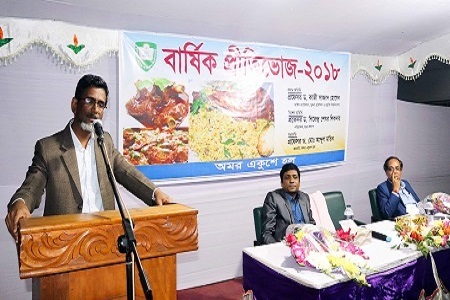 Provost of Rokeya Hall Prof. Dr. Mohammad Abu Yousuf presided over the function. At the ceremony crest was handed over to the outgoing students by the guests. The Freshers' Reception of '18 batch and Farewell Ceremony of '14 batch of students of Electronics and Communication Engineering (ECE) Department of Khulna University of Engineering & Technology (KUET) was held on 05 March, 2019 at the Student Welfare Center at 5:30 PM. The Hon’ble Vice-Chancellor Prof. Dr. Quazi Sazzad Hossain graced the occasion as the Chief Guest. Head of ECE Department Prof. Dr. A.B.M. Aowlad Hossain and Director (Students’ Welfare) Prof. Dr. Shibendra Shekher Sikder were present as the Special Guests. President of ECE Association Prof. Dr. Monir Hossen presided over the function. At the ceremony freshers' students were received with flowers and crest handed over the outgoing students by the guests. Professor from the Hong Kong University of Science and Technology Dr. Guang-Hao (GH) CHEN visited KUET. On 03 March at 3:00 PM the Professor met Vice-Chancellor of KUET Prof. Dr. Quazi Sazzad Hossain. There also a meeting was held at the Vice-Chancellor office of this University. Former Vice-Chancellor of KUET Prof. Dr. Muhammed Alamgir, Dean of Civil Engineering Faculty, and Director of Institute of Disaster Management (IDM) Prof. Dr. Quazi Hamidul Bari, Head of Chemical Engineering Department Prof. Dr. Mihir Ranjan Halder, Registrar G M Shahidul Alam were present there. Before, at 10:00 AM Prof. Dr. Guang-Hao (GH) CHEN visited the IDM. Former Vice-Chancellor of KUET Prof. Dr. Muhammed Alamgir, Head of URP Department Prof. Dr. Md. Mustafa Saroar, Director (Planning & Development) Prof. Dr. Kazi A B M Mohiuddin, Professor of CE Department Prof. Dr. Khondoker Mahbub Hassan and Faculty members of IDM were present there. Mentioned that Professor from the Hong Kong University of Science and Technology Dr. Guang-Hao (GH) CHEN came here to evaluate for launching MSC in Sanitation course at IDM in KUET. BUILTECH Fest 3.0 is a building engineering, construction engineering and management based contest which was arranged by Department of Building Engineering and Construction Management (BECM) of KUET. This event was held on 28 February-01 March, 2019 at KUET in order to enhance the creativity and capability of the students in this sector all over the country. This event was inaugurated by the Chief Guest, Vice-Chancellor of KUET, Prof. Dr. Quazi Sazzad Hossain on 28 February at 3.30 PM at the Student Welfare Centre. Former Vice-Chancellor of KUET Prof. Dr. Muhammed Alamgir, Dean (Acting) of Civil Engineering Faculty Prof. Dr. Khondoker Mahbub Hasan and Additional Chief Engineer of PWD Khulna Zone Engr. Prodip Kumar Bosh were present as special guests. Head of BECM Department, Md. Ikramul Hoque presided over the function. Assistant Professor of BECM Department and also Secretary of this fest Md. Hamidul Islam delivered welcome speech. On 01 march Friday, at the Closing Ceremony of this Fest, Director of Students Welfare Prof. Dr. Shibendra Shekher Sikder distributed prize as the Chief Guest of the event among the winers participated in Cad Contest, Mechanics Mania, Management Mastermind, Case Study, Photography Contest and Poster Presentation. Students from Countrywide various Departments of the Universities such as Building Engineering, Construction Management, Civil Engineering, URP and Architecture participated in this fest. Two days long (23-24 February 2019) 6th International conference on Integrated Solid Waste & Faecal Sludge Management in South-Asian Countries WasteSafe 2019 successfully held at KUET. The experts, participates at the conference expressed their hope highly that this conference will bring new horizon in solid waste & faecal sludge management sectors in the developing countries. KUET, Bauhaus University Weimer Germany, University of Padova, Italy and International Waste Working Group (IWWG) jointly organized the conference aiming to exchange views and experiences at international level and to understand solid waste and faecal sludge management concept. This conference was sponsored by the UGC, SNV, WaterAid, Seven Rings Cement, Practical Action and China Geo-Engineering Corporation. Hon’ble Mayor of Khulna City Corporation Talukder Abdul Khaleque inaugurated the conference as the Chief Guest on 23 February Saturday at 9:00 AM. Prof. Dr. Muhammed Alamgir, Chair, WasteSafe 2017 International Conference and former Vice-Chancellor of KUET, delivered his welcome speech and presided over the function. Acting Vice-Chancellor and Dean of CE Faculty Prof. Dr. Quazi Hamidul Bari was addressed as the Chief Patron, Theme Paper presented by the Prof. Raffaello Cossu, University of Padova, Italy entitled as “Closing the Lopes of Waste Management Strategy”. Mehrab Ul Goni, Practical Action Bangladesh and Dr. Md. Liakath Ali, WaterAid Bangladesh were addressed on behalf of the strategic partners. Prof. Eckhard Kraft and Prof. Liz Bachhuber, Bauhaus University Weimar, Germany were addressed as the Co-organizers. This time on behalf of Special Guest Mr. Jason Mitchell Belanger, Country Director, SNV Bangladesh, his written speech was also read out by his representative. After inaugural session the exhibition on “The Art Work from BUW” was opened for “100 yrs. Celebration of Bauhaus University Weimar” at KUET Archive, Ground Floor of SWC. Waste experts from different countries including Bangladesh, Germany, Italy, India, Nepal, and Zimbabwe were participated in this conference. Conference Dinner and an attractive cultural program were also held in a local hotel in the evening of 1st day of conference. A total number of 77 technical papers including 3 Key-note Session, 3 key-note papers, 1 theme paper were presented in 12 parallel technical session, where research scholars, experts, engineers, professionals of related field exchange views among themselves. This time ‘WasteSafe Lifetime Achievement Award 2019” given to Prof. Raffaello Cossu of Itraly. Dr. M. Harunur Rashid’s best paper awards were given to the three authors from Bangladesh, Italy and Nepal. Best Innovation also handed over to a researcher from Bangladesh. On February 24 at 6:00 PM. the closing session of the conference was held at the SWC of KUET. Prof. Raffaello Cossu, University of Padova, Italy; Prof. Eckhard Kraft and Prof. Liz Bachhuber, Bauhaus University Weimar, Germany; Dr. Nawa Raj Khatiwada, Academician and Waste Management Expert, Nepal, Professor Dr. Quazi Hamidul Bari of CE Department of KUET were delivered their speech. Dr. Kazi A.B.M. Mohiuddin of KUET declared the names of the recipient of Best Innovation award. Chair of the conference Prof. Dr. Muhammed Alamgir and former Vice-Chancellor of KUET presided over the event. On behalf of the organizer he gratefully recalled the supports and thanked all for the successful end of this conference. He also declared the next 7th Conference of WasteSafe 2021, that will be held on 27-28 February 2021 while Bangladesh celebrates it 50 years Anniversary of the Independence. Before this conference, the first, second, third, fourth and fifth conference were successfully held in the same place, respectively, in the year of 2009, 2011, 2013, 2015 and 2017. The inauguration ceremony of Inter Hall Cricket Tournament 2019 of KUET held on 22 February at 02:00 PM at the University central play ground. Dean of Civil Engineering Department and Vice-Chancellor (Acting) Prof. Dr. Quazi Hamidul Bari was present as the Chief Guest. Director of Students Welfare Prof. Dr. Shibendra Shekher Sikder presided over the event. Among others Provosts, Assistant Provosts, Assistant Director of Students Welfare, Teachers, Officers, Staffs, viewers and students were present there. After inauguration ceremony the first match of the tournament was held between Bangabandhu Sheikh Mujibur Rahman Hall and A. K. Fazlul Haque Hall. Bangabandhu Sheikh Mujibur Rahman Hall won by 5 wickets. Mentioned that, the matches of the tournament will be held between the six residential Halls of the male students of this university and the final match will be held on 26 March 2019. Khulna University of Engineering & Technology (KUET) observed Shaheed Dibash & International Mother Language Day 2019 remembering the supreme sacrifices of the valiant sons of the soil who fought for establishing rights of the mother tongue in 1952. At 09:00 PM on 20 February, cultural program was held at in front of KUET central Shaheed Meenar. On 21 February, 12:01 AM Vice-Chancellor of KUET Prof. Dr. Quazi Sazzad Hossain offered floral wreaths on KUET Central Shaheed Meenar on behalf of the University. Later Teachers’ Association, Director (Students Welfare), Visiting Professors and Students from Germany, Italy, India and Zimbabwe, Officers Association, Provosts and students of different Halls (A.K.Fazlul Haque Hall, Lalan Shah Hall, Khan Jahan Ali Hall, Dr. M.A.Rashid Hall, Rokeya Hall, Amar Ekushey Hall, Bangabandhu Sheikh Mujibur Rahman Hall), Additional DIG of Police Training Center, Khulna, Commanding Officer of 3rd Armed Police Battalion, Khulna, Bangladesh Chattra League, KUET, Bangabandhu Engineers Association of KUET, 3rd Class Karmachari Samiti, 4th class Karmachari Samiti, Master role Karmachari Samiti, Bangabandhu Karmachari Parishad, Recitation Organization Shore-Oa, KUET Theater, Drupodi Dancer Association of KUET, Larger Kushtia Ochin Pakhi Association, ESE Association, Hall Karmachari, Notordem College Association of KUET, OKS, Notre dame Association, Voluntary Blood Donation Society of KUET (DREAM) and other organizations, Educational Institutions placed floral wreaths at the memorial. On 21 February morning, Black flags were hoisted and the national flag was half hoisted atop all important buildings in the campus. At 09:00 AM, a drawing competition for children was held at the university Student Welfare Centre. VC of KUET Prof. Dr. Quazi Sazzad Hossain was present as the chief guest and distributed prize among the winners. Later Vice-Chancellor Prof. Dr. Quazi Sazzad Hossain took part in the discussion meeting as Chief Guest where Director (Student Welfare) Prof. Dr. Shibendra Shekher Sikder presided over the program. Dean of CE Faculty Prof. Dr. Quazi Hamidul Bari and Dean of EEE Faculty Prof. Dr. Mohiuddin Ahmad were present as the special guests. Among others General Secretary of Teachers Association Prof. Dr. Pintu Candra Shill, Registrar G M Shahidul Alam, Professor of CE Department Dr. Md. Rafizul Islam, President of Officers Association Engr. Md. Anisur Rahman Bhuiyan, President of 3rd Class Karmachary Samiti Md. Mamunur Rashid Jewel, President of Bangabandhu Karmachari Parishad Sonali Binte Sharif were delivered speech in the discussion meeting. After Asr prayer a Milad-Mahfil was held at the KUET Central Mosque for the peace of the departed souls of the martyrs and also peace and happiness for the country and nation. Newly elected Executive Committee of Teachers Association of KUET placed wreaths on Mausoleum of the Father of the Nation Bangabandhu Sheikh Mujibur Rahman at Tungipara on 16 February, 2019. Special prayer was held for seeking eternal peace for Bangabandhu and the other martyrs of August 15, 1975. KUET Vice-Chancellor Prof. Dr. Quazi Sazzad Hossain was present there. Vice-President of Teachers Association Prof. Dr. Md Mustafa Sarwar, General Secretary Prof. Dr. Pintu Chandra Shill, Assistant General Secretary Dr. Md. Abdul Hasib, Sports Secretary Dr. Md. Ashraful Alom, Cultural Secretary Abu-Hena Mostofa Kamal, From the members Prof. Dr. Abdul Motin, Prof. Dr. M. M. Touhid Hossain, Prof. Dr. Sk. Md. Masudul Ahsan, Dr. Md. Elias Uddin and other teachers were present there. Dr. M A Rashid Hall of KUET celebrated Annual Dinner on 14 February in the evening. Vice-Chancellor of KUET Prof. Dr. Quazi Sazzad Hossain graced the occasion as the Chief Guest. Provost of Dr. M A Rashid Hall Prof. Dr. Sajal Kumar Adhikary presided over the function. Director (Student Welfare) Prof. Dr. Shibendra Shekhar Sikder was present as Special Guest. Among others provost and assistant provost from other halls, Teachers, Officers, Assistant Provosts and residential students of Dr. M A Rashid Hall of KUET attended the function. Lalon Shah hall of KUET celebrated Prize Giving Ceremony, Cultural Program and Annual Dinner on 13 February, Wednesday in the evening. Vice-Chancellor of KUET Prof. Dr. Quazi Sazzad Hossain graced the occasion as the Chief Guest. Provost of Lalon Shah Hall Prof. Dr. Md. Abdullah Elias Akhter presided over the function. Director (Student Welfare) Prof. Dr. Shibendra Shekhar Sikder was present as special guest. Among others provost and assistant provost from others hall, Teachers, Officers, Assistant Provosts and residential students of Lalon Shah Hall of KUET attend the function. Amar Ekushey Hall of KUET celebrated Annual Dinner on 12 February in the evening. Vice-Chancellor of KUET Prof. Dr. Quazi Sazzad Hossain graced the occasion as the Chief Guest. Provost of Amar Ekushey Hall Prof. Dr. Md. Abdul Matin presided over the function. Director (Student Welfare) Prof. Dr. Shibendra Shekhar Sikder was present as Special Guest. Among others provost and assistant provost from other halls, Teachers, Officers, Assistant Provosts and residential students of Amar Ekushey Hall of KUET attended the function. Vice-Chancellor of Khulna University of Engineering & Technology (KUET) Prof. Dr. Quazi Sazzad Hossain inaugurated the horizontal expansion of Civil Engineering Building on February 11, 2019 at 10 am. In a short speech VC thanked Hon’ble Prime Minister, Ministry of Finance, Ministry of Education, UGC and all concern related to this project. Head of the Civil Engineering Department Prof. Dr. Md. Shahjahan Ali, Director (P & D) Prof. Dr. Kazi A. B. M. Mohiuddin, Director of this project Md. Anisur Rahman Bhuiyan, Chief Engineer A B M Mamunur Rashid spoke on the occasion. Superintendent Engineer Dr. Md. Julfikar Hossain presented the function. Other Students, teachers, Officers and Staffs were also present in the function. Khulna University of Engineering & Technology (KUET) celebrated Saraswati Puja, one of the religious festivals of the Hindu community on 10 February 2019, with traditional gaiety, religious fervor and spirit of pursuit of art and knowledge which goddess Saraswati provides. The Hindus worship Saraswati, the goddess of knowledge, music, art and culture, on the Vasant Panchami day with pomp every year mostly in educational institutions, where the students seek the blessings of goddess Saraswati. Vice-Chancellor of KUET Prof. Dr. Quazi Sazzad Hossain, Vice-Chancellor of North Western University Prof. Dr. Tarapada Bhowmick, Head of Chemical Engineering Department Prof. Dr. Mihir Ranjan Halder, Head of Mechanical Engineering Department Prof. Dr. Sobahan Mia, Assistant Professor of Industrial Engineering and Management Department Subrata Talapatra, President of Puja Udjapon Committee Prof. Dr. Pintu Chandra Shill and Treasurer of Puja Udjapon Committee Rajan Kumar Raha, Teachers, Students, Officers, Staffs were present there.